The line is now fading, but long-term Needham residents still remember when Rosemary Street. formed the “boundary” between Needham Center and Needham Heights. Needham in 1850 was not much different from Needham in 1711. Most Needhamites were farmers, or worked in the trades that supported a small farming community. The town and church were centered on the intersection of Nehoiden Street and Central Avenue to be near the coach roads – the main travel arteries of the time. The rest of Needham was thinly settled – mostly woodlots and pastureland, except for where it was too swampy to farm much at all. Highlandville (Needham Heights) was not much different, with the same farms and pastures as the center. Everything changed after 1850. In 1853, the railroad came to Needham, in part to transport gravel to Boston to fill the Back Bay. Stations were built at Highlandville and in the empty pastureland of the Great Plain. Once the railroad was built, businesses and homes were increasingly drawn away from the old center on Nehoiden Street and toward the convenience and activity of the two train stations. Also in the 1850s, Needham saw its first significant influx of immigrants since the 1700s. Irish Catholics escaping the Famine flocked to the Boston area and surrounding towns. English knitters from the Midlands, displaced by the growing industrialization of the English textile industry, also came to this area. Many of these families settled in Highlandville. As the knitters set up their own businesses and then expanded their mills, the need for labor grew, and the Irish and English, and later the Italian and Polish immigrants found work and settled in the neighborhood. The new industries and immigrants transformed the Heights economy from farms to manufacturing, and created a new political and social culture that was very different from the old colonial culture of the Center. The two sections took on different characters that reflected their differing histories. The Heights was more diverse in nationality and religion, and industrial rather than agricultural. Neighborhood enclaves were based on nationality. The local game was cricket rather than baseball. 1700 Needham volunteers used their shovels, wheelbarrows, steam shovels, tractors and plows to level Richwagen’s Hill and create Memorial Park in honor of the town’s World War I veterans and casualties. However, despite any differences, the construction of Memorial Park was an act of unity, a sharing of grief and memory. Needham had just recovered from the twin traumas of World War I and the influenza epidemic. The town was more fortunate than many, suffering relatively few losses from either event. Nevertheless, it had been two generations – the Civil War – since Needham had faced such tragedy. The site chosen for the park was also symbolic – Richwagen’s Hill on Highland Avenue, just midway between the Center Common and the Heights Common. On April 19, 1921, two parades set off with music and fanfare – one from the Center, and one from the Heights – to meet in the middle at Richwagen’s Hill. 1700 people (one-third of the town) volunteered to work, bringing wheelbarrows and shovels, tractors and horses, to dig down the hill and create a level field. Veterans of the War wore their old uniforms. The Women’s Relief Corps set up a camp kitchen in the field across the street (now Sudbury Farms’ parking lot) to feed the workers. 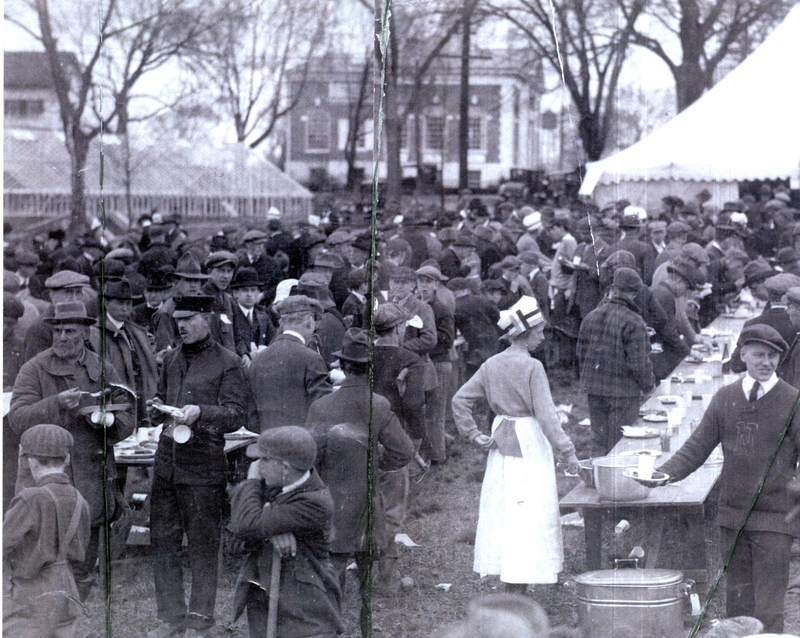 The Women’s Relief Corps set up a camp kitchen to feed the workers a lunch of beans, hot dogs, bread, cheese, pickles, pies, donuts and coffee. The Public Library is in the background. A large boulder found during the digging was set up for the bronze memorial plaque. The new Memorial Park was dedicated “To Those of Needham who Served their Country in the World War, 1917-1918, and in Memory of Those Who Died in Service.” In 1995, additional monuments were dedicated in honor of Needhamites who served in the country’s other wars. Created by the community to honor its heroes, Memorial Park remains at the literal and figurative center of Needham as our park, playing field, and gathering place.